Sing your way to grammar success! While you're reading this blog, why not listen to Waltzing Matilda by the fireside? I tell my students that the best way in the whole world to remember something is to make a mistake first! So in my world a mistake is a good thing. But if no one tells you, how can you learn? So here's the formula: (1) make a mistake; (2) someone points it out and explains it in a way you can understand; (3) you have a light bulb "aha!" moment! So Go Ahead and Make Grammar Mistakes! Don't be afraid to get it wrong okay? Just jump right in and make mistakes.Besides, if I include your sentence next time, I'll include your blog link! What cool lyrics! From my research, it's one of those old songs that keeps evolving and no one really knows what it's about. I mean who writes like this anymore! Oh there once was a swagman camped in the billabong, Under the shade of a Coolibah tree, And he sang as he looked at the old billy boiling, Who'll come a waltzing Matilda with me? Now the second part of this blog has the submitted sentences, complete with a simple way to remember when to use each word correctly. This part of the blog is a story inspired by my fans and is best read while listening to the video above. Hey! If you like to sing, go ahead and sing the lyrics below with that guy by the fireside. I tried it. You have to adjust the syllables a bit, but it works. It will help the grammar lesson below stick. It's the joy factor. Oh, there once was a wombat camped in my lavender, Under the shade of my coolipear trees, And she sang as she birthed out seven baby wombats, Who'll go a waltzing through my lavender trees! Who'll come a helpin' me rid my field of wombats? Who'll come a helpin' my lavender and me? Helpin' my lavender with honey and vinegar, Who'll come a helpin' my lavender and me? Okay, enough of that. On to grammar! Write two sentences. In one sentence use the word "that" correctly. In the second sentence, use the word "which" correctly. The sentences should NOT be questions. Both should be grammatically correct. Both sentences should include the words "bombardier beetle." The information in your sentence should include scientifically incorrect information about the bombardier beetles. 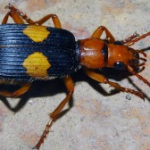 (1) Bombardier beetles are ground beetles that can be found all over the world. (1) There is a wild looking purple and pink polka-dotted "bug" that is called The Bombardier Beetle. (2) The Bombardier Beetle is not only crazy looking but also releases spit "bombs" which can put your eye out! Warning! If you're a fourth grader looking for true scientific information about bombadier beetles or wombats, please go back to Google. This is a true grammar blog, but has very silly science! Oh dear!!! I have only one solution for this burrowing situation which is obviously causing total havoc in the lavender field!! Sing to them, yes in the key of F, sing Waltzing Matilda, bring in two harmonies during the chorus and you will surely have them following you directly to their chariot that awaits them at the bottom of the garden. Then Tara Yvonne Chatzaki came up with a great solution to the wombat issue. Now, let's see….I'm trying to remember what I did the last time I was infested with lavender eating wombats. If, my memory serves me well the one thing that really got under their scales was hosing them with a solution of vinegar and honey which brings them out in a terrible rash. Doing this will send them running to the hills! Let me know if it works sweetie! :)) (Thanks Deb for being scientifically incorrect!). The rule is you should use that with restrictive clauses and which with non-restrictive clauses. Also, the which clause should be surrounded by commas (at beginning and end of clause). Now don't panic. I have to post the rule! The Easiest Way to Remember! Use that to give information that is essential to the meaning. To test, remove the word that and what goes after it (the clause). If the meaning of the sentence changes, you've got the correct word! My sentence is a good example. If I remove that is essential to the meaning, my sentence will state a totally different rule. It would read: "Use that to give information. See how that last sentence wouldn't help you at all in this case? Use "which" when giving extra information. The words in the clause that begins with which tells us something interesting, but removing it does not change the meaning. For example, take Sharon Cobb's contribution: The Bombardier Beetle is not only crazy looking but also releases spit "bombs" which can put your eye out! Keep in mind now, that her sentence should be scientifically incorrect. Let's pretend she's writing a very important field guide. If you remove the clause that begins with which, the field guide will be missing crucial information important to the safety of the reader (if it was true of course). So I'm afraid we'll have to say this sentence should use the word that instead. Let me try making a which sentence out of Sharon's information. The Bombadier Beetle, which is crazy looking, also releases spit "bombs" that can put your eye out! There, I did it, and it shows you something else too. Usually, there are commas around the which phrase. You could just as easily write it this way: The Bombadier Beetle (which is crazy looking) also releases spit "bombs" that can put your eye out! If we remove the phrase that begins with that, the meaning of the sentence will change. Bombardier beetles have a unique system of defense; a combination of two liquids that mix together and become a hot and noxious fume sprayed at predators when threatened. That works. Good work Ariana! Bombardier beetles have a unique system of defense; a combination of two liquids, which are stored in a reservoir. This most definitely changes the meaning of the sentence. The phrase we removed completes the explanation of the unique system of defense. Without it, we have no idea how the liquids are utilized in the insect's defense. Watch for future grammar quizzes on facebook, designed to allow the learner to make creative grammar errors. You might just inspire the next blog! Thanks to all brave sentence submitters. I honor your mistakes and my mistakes. Here's to learning everyday! I write. I edit. I tutor. I laugh. Need help with a writing project?